Please read Suspicion Nation. | Finding delight. In the wake of the recent tragedy in Ferguson, Missouri, where yet another one of our black youths was brutally shot and killed, my brain went into overdrive with questions. Why do we keep letting this happen? How many more mothers must bury their sons before we value human life more than guns? Why must we time and time again equate dark skin with fear and suspicion? Why is this fear perpetuated every time someone tries to warn, protect or dissuade me from going into an area populated by a race not my own? Seeking answers, I did what any analytically minded, life-long learner and non-fiction junkie would do–I bumped a book up on my reading list. A few years ago I read Lisa Bloom’s Think: Straight Talk for Women to Stay Smart in a Dumbed Down World and fell in love with both the book’s message and it’s attorney turned journalist author. I read books she recommended, kept up with opinion pieces she put out and followed her on Twitter. Later, when I became baffled by what I saw going on in the courtroom during the George Zimmerman trial, I turned to her NBC legal analysis for clarity. She tracked, researched and reported on this trial from gavel to gavel. And the story…the INJUSTICE…the (excuse my language) bumblefuck of a job the prosecution did…got under her skin. And rightly so. Because Trayvon Martin is not the first black kid to lose his life while a killer walks free. He wasn’t the last. So Bloom got to work; articulating what happened and why it KEEPS happening. What emerged was the fantastic book Suspicion Nation: The Inside Story of the Trayvon Martin Injustice and Why We Continue to Repeat It. If Mike Brown’s murder has affected you, as it did me, please read this book. 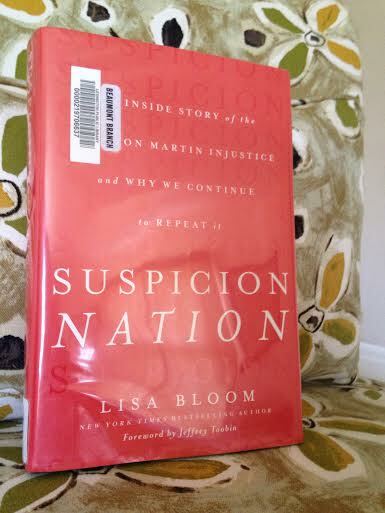 From a play-by-play legal analysis as to how Zimmerman walked away with an acquittal to a candid portrait of our country’s racial biases, Bloom’s book is a chilling depiction of the state things are in. But it’s not without solutions. And when you read it, you’ll probably think of a few of your own, too. Even if they’re small steps, we HAVE to do better. Acknowledging the systematic barriers forming a blockade around our country’s young, African-American males is a great place to start. Lisa Bloom is part of the Michael Brown Justice Panel, a group of legal professionals working to stop the shootings of unarmed black men. Suspicion Nation was selected as a #FergusonReads book. Part 1 and Part 2 of an interview with Bloom on the book and lessons for Ferguson.